This April, try something different. Even if you don’t think that you have a green thumb, you can grow and cultivate plants that will happily latch on your new fence. This April, try something different. Even if you don’t think that you have a green thumb, you can grow and cultivate plants that will happily latch on your new fence. These climbing plants can also help make an old fence look more beautiful than ever before. Here are some of the possibilities for your consideration. Roses aren’t just for showing your lover that you care about them. Roses make any garden look better already by how pretty they are. You’ll need to use some elbow grease, nails, and screws to get the roses to start climbing the way you want them to, but all of that effort will be worth it. 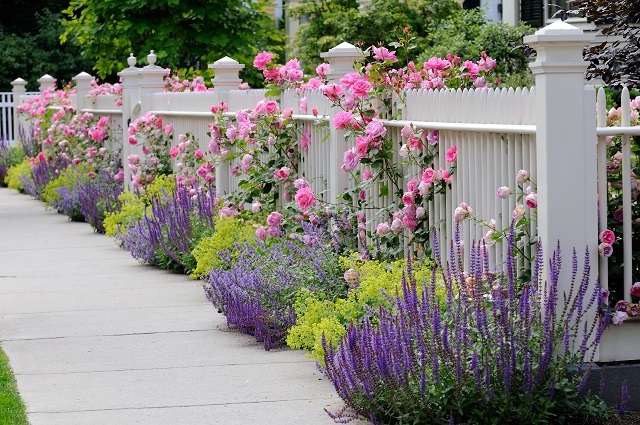 Unlike other vine plants, the roses won’t dig in, which means you can use them with any fence that you wish. Plus, with so many different colors and scents available, you don’t only need to have a red rose in your garden. No matter what kind of soil or light conditions you have around your yard, Virginia creeper won’t mind. In fact, it can succeed even under harsh or unfavorable settings. While the leaves look green, once the fall comes around they will bloom in a deep red bordering on crimson. You’ll need some plant ties to help keep the creeper in place, but once they’re set up, they’ll start to flourish. If you already have some Virginia creeper growing, then it’s time to take care of it – trim back the leaves and extract the roots from the slats of your wooden fence. Wisteria plants show off in comparison to other plants. They have grape clusters of white or purple flowers. Sometimes the flowers will be lilac or pink instead. Unlike the other plants on this list, wisteria is picky about where it will thrive. However, these plants are best suited for vinyl or metal fences, since they can destroy wooden fences if you’re not careful. Finally, let’s look at morning glory. These plants are annuals, meaning that they only grow once a year. They’ll need some scaffolding or string for support. Make sure to keep them warm – so these might have to wait until later in the spring before you can start using them. The wait is worth it since you’ll see a spectacular blaze of colors – blue, purple, magenta, pink, and white, all coaxed into sight by the dawn’s early light. This entry was posted on Friday, April 12th, 2019 at 2:57 pm. Both comments and pings are currently closed.